In the first Bulgarian documentary movie in 3D you will witness one of the most Bulgarian traditions – Nestinarstvo (Fire Dancing). 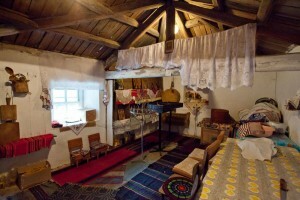 The old custom is still preserved in the small village of Bulgari, which is situated in the foot of Strandzha Mountain. “Steps in the Fire – 3D” is a movie about a centuries-old sacrament, a sacrament stretched between holy and pagan. The authentic nestinars (fire dancers) dance in the fire only once a year – in the evening of June 3 (this day celebrated the saints Konstantin and Elena according to the old calendar). This is why experiencing the movie in 3D makes it even more unique. You will have the opportunity to be there 365 days, to learn more about the most prominent nestinar, Grandma Zlata, and about the magic of fire dancing. “Steps in the Fire – 3D” will surprise the viewers not only with the 3D perspective that it offers but also with the fact that the movie is a product of the interesting collaboration between the Bulgarian director Andrey Hadjivasilev and the American documentary filmmaker Melody Gilbert. The movie is made entirely by the team of film studio “Revive Vision” with the kind cooperation of Tsarevo Municipality and TechnoRental BG. Special screening with partnership of Bulgarian Cultural Institutes in: Warsaw, Budapest, Prague, London, Wien, Bratislava, Belgrade. The custom honors the saints Konstantin and Elena and culminates in the dance on the fire, the trance and the prayers for health and prosperity. 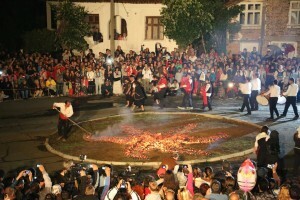 The fire dancing is a testimony of a unique ritual that has preserved its identity only in the village of Bulgari, Tzarevo Municipality. Not only dancers, but also a priest, churchwardens, icon carriers and musicians participate in the enigmatic ritual. Always a week before the big day, the participants in the tradition clean the “ayazmas” (holy places) of the saints. On June 3, with church bells and a liturgy, the icons are sanctified and then the icon carriers bring them to the konak where the chruchwardens “clothe” the icons. A procession let by the churchwarden, the musicians and the icon carriers visits the “ayazma” of Saint Konstantin. There, the churchwarden incenses and washes the icons and leaves them is a special plank-bed. After the holy water blessing, the procession returns to the konak and meets the nestinars. The icon carriers leave the icons to “rest” until the evening. Undoubtedly, one of the most important elements of the tradition is the ritual fire. The fire kindling takes at least 4-5 cubic meters of oak trees. The ember spreading happens in a strict manner- first a cross is formed, then a star and finally a circle that is 3 meters in diameter and is 10 centimeters deep. The icon carriers take the icons from the konak and circle the church and the fire three times. Accompanied by bag pipes and drums, the nestinars enter the fire. The special dance under trance continues for about 5 minutes and then the nestinars cross themselves and exit the fire. The distinctive nestinar “horo” (traditional Bulgarian dance) concludes the ritual. On the next day, the procession gathers again and visits the “ayazma” of Saint Elena. In the evening, the icon carriers leave the icons in the church until the next year. At the end of September 2009, the nestinarstvo ritual was included in UNESCO’s List of the Intangible Cultural Heritage of Humanity. The Village of Bulgari is situated 17 kilometers away from the town of Tzarevo, 300 meters above sea level. Lying on the flat back of a mountain ridge and surrounded by deep valleys, the village offers a magnificent view of the rounded ridges of the Strandzha Mountain. East of the village of Bulgari there is the oldest Bulgarian reserve „Silkosia“ and 7 km. northeast there is the protected area „River Marina.“ The village was first mentioned in a document dating back to 1454which proves that it is one of the oldest Strandzha villages, probably existing since the First Bulgarian Kingdom. According to the historians, its residents are direct descendants of proto-Bulgarian soldiers that protected the Khans security on our southern border. The church „St. St. Constantine and Elena“is situated in the village center. It was built in the second half of the nineteenth century. In 1903, during the Ilinden Uprising the church was burned along with the entire village. It was restored in 1910 as a monument.